I saw my first daffodils over the week-end when my friend Marilyn and I went for our first walk in months. It was so warm I did not need my coat! However, I did not take my camera because I wasn’t prepared to see any flowers. A few days earlier, my classmate and “poet-in-residence,” Mary Lou Meyers, sent me a poem about daffodils. 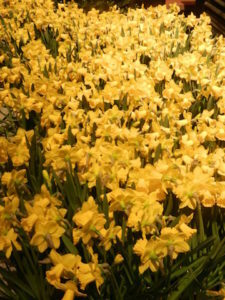 I looked through my pictures of the recent Philadelphia Flower Show and found one picture of daffodils, pictured here. The theme was Holland: Flowering the World and there were thousands of tulips, but I did find some daffodils. So here is Mary Lou’s poem and my “indoor” daffodils. Once Spring has finally blossomed, I can take outdoor photos of all the flowers. Thanx, Mary Lou! which rose up and died in the ripping cold. P.S. This is probably my last posting for March. I totally forgot March was Women’s History Month, so I apologize. I recently received a solicitation from the women’s museum-in-the works in Washington, D.C., so I may post something about that on the 31st. This, to me, is perfect example of how history is made. Because of a concussion, Jayna was unable to attend the Washington March right after the inauguration. 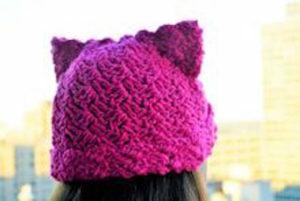 While recovering, she took a knitting class and came up with the idea of the Pussycat Project on November 22nd last year. I think I have enough yarn to make a pussyhat for me. Every time I wear it will be a reminder to me and others how women can make a difference with a ball of yarn and two sticks (knitting needles). You are currently browsing the Menupause weblog archives for March, 2017.